all-star Funky brass band inspired by the Mardi Gras sounds of New Orleans street bands. 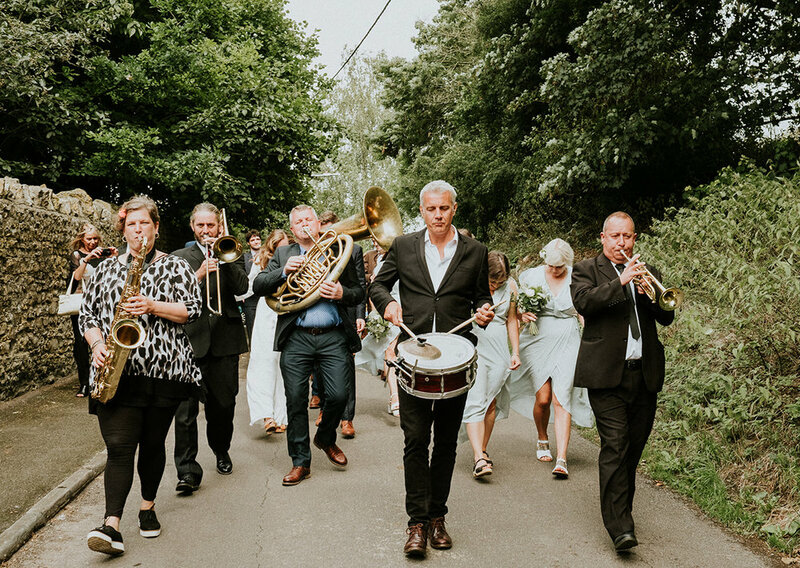 Brass Junkies are a dynamic and versatile brass band based in Bristol. 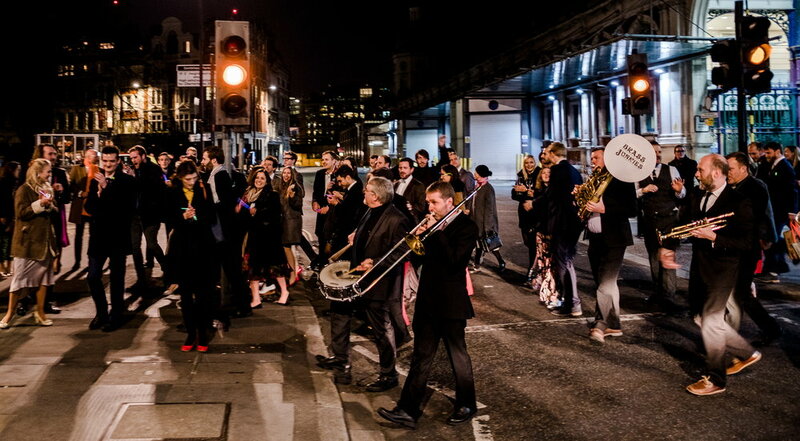 With a flexible lineup and diverse repertoire, they perform New Orleans style pop and funk classics in the tradition of the finest American street bands such as The Dirty Dozen Brass Band, The Soul Rebels and The Rebirth Brass band. 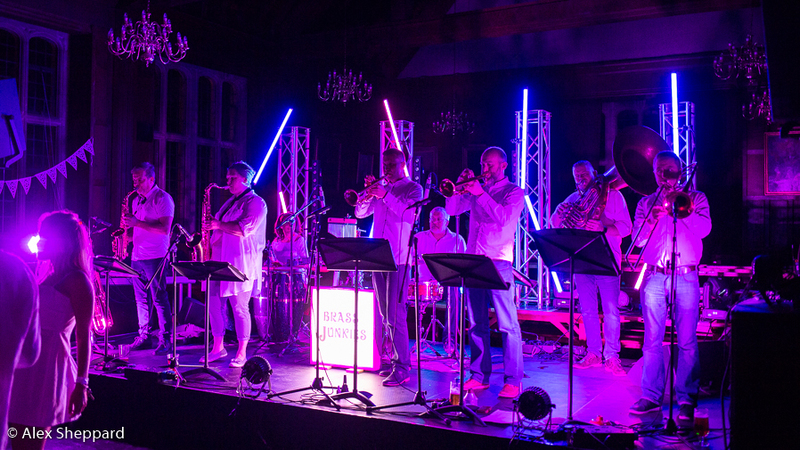 Band members have played with some of the best in the business including Kasabian, Tom Jones, Kellis, and Muse in venues such as The Royal Albert Hall, Glastonbury main stage and 'Later' with Jools Holland. Whatever and wherever they’re playing, you can be certain that this high-energy, good-time music will bring some carnival atmosphere to the place! 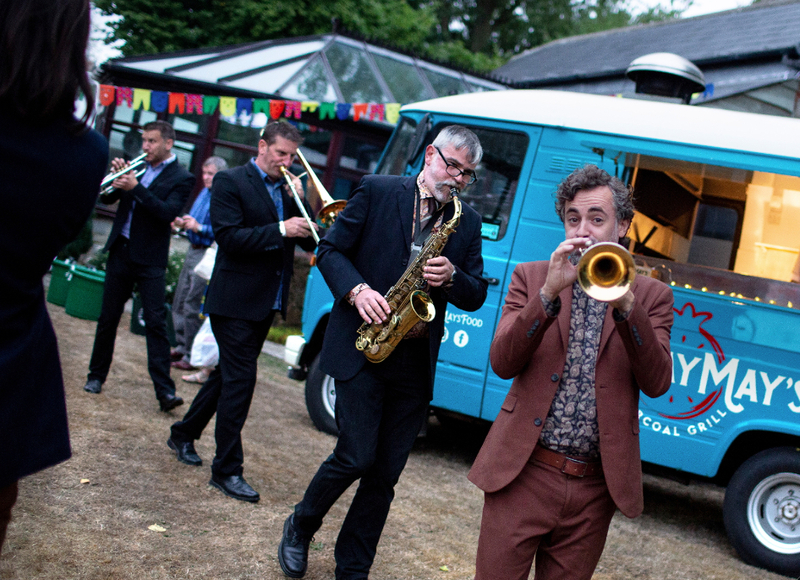 Dynamic, funky - UK’s answer to those groovy New Orleans brass bands! Brass Junkies cover everything from New Orleans masterpieces to Taylor Swift, Amy Winehouse, Stevie Wonder, Al Green and Prince. 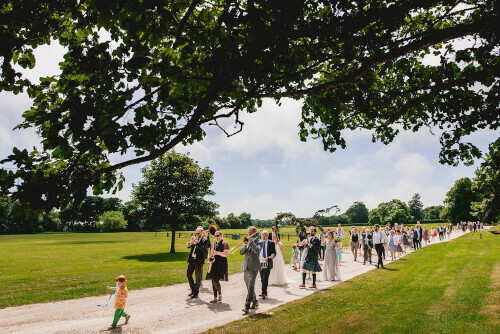 The lineup of the band can be tailored to the requirements of the event, ranging from the more compact 5-piece to the full heavyweight sound of the 8-piece. We can also add the option of female vocals to give the set that extra dimension. 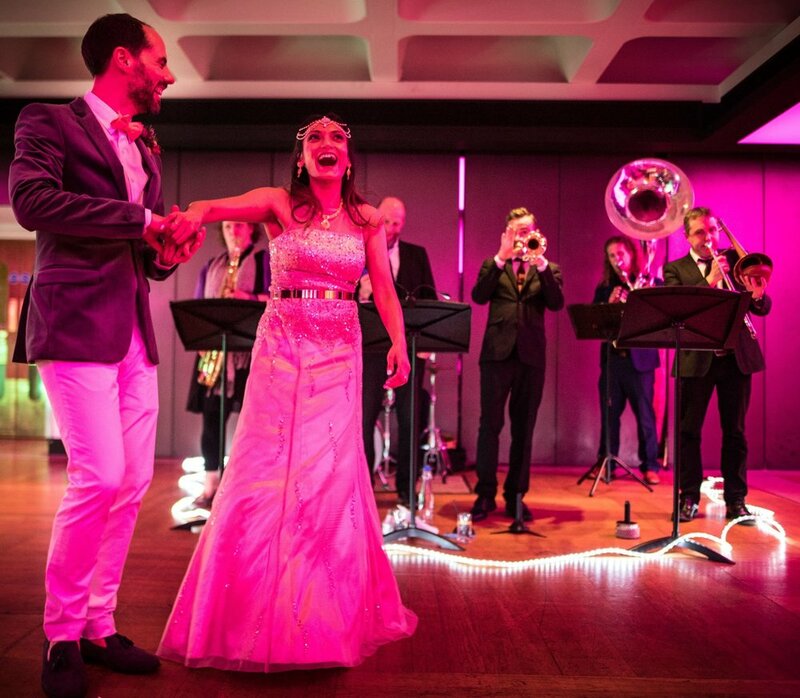 Musical performances can be subtle and background to full-on party where your guests will be dancing all night. We are always adding new songs to our repertoire list. Please click the button below to view or download our most recent list. 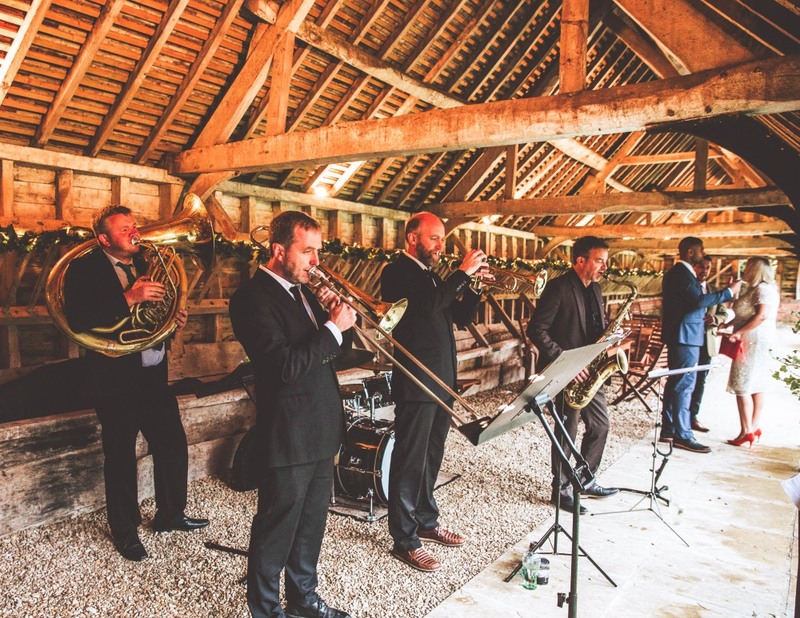 Brass Junkies are passionate about their music and they will help make your wedding day one to remember. 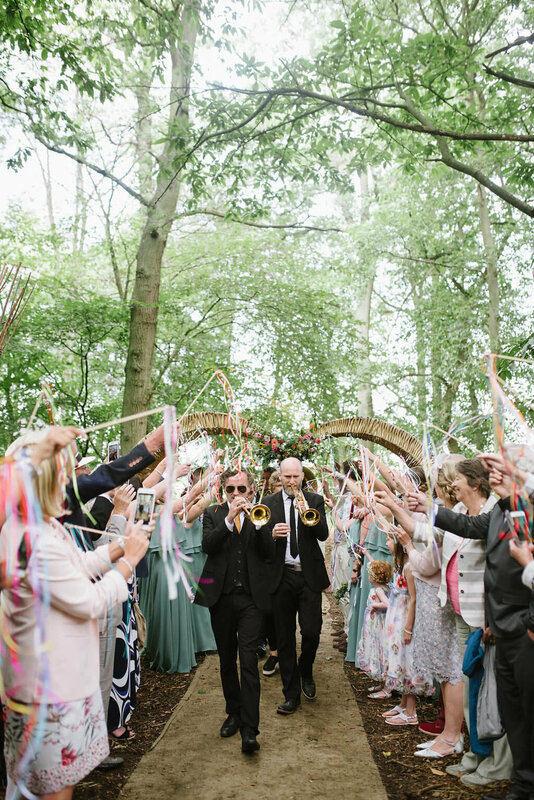 The band can be mobile and acoustic including playing outside on the move amongst the guests! 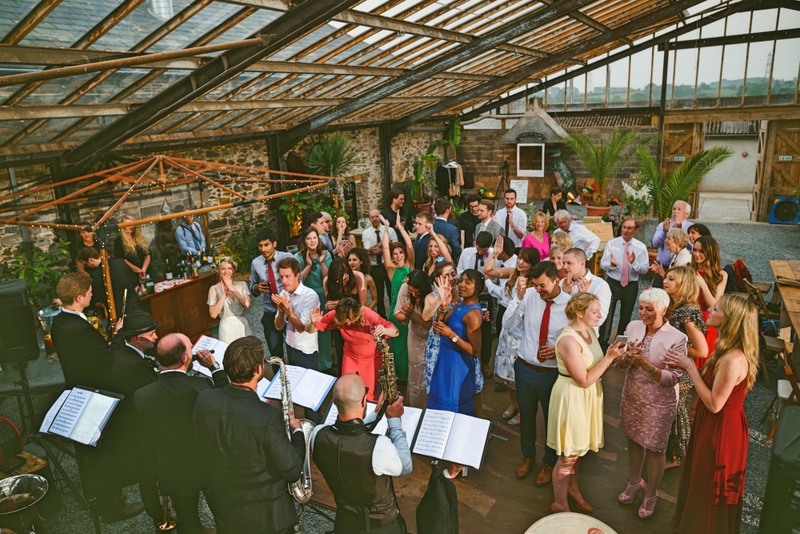 We are equally at home performing on or off the dance floor with/without a PA and are adept at tailoring the performance for any wedding venue. 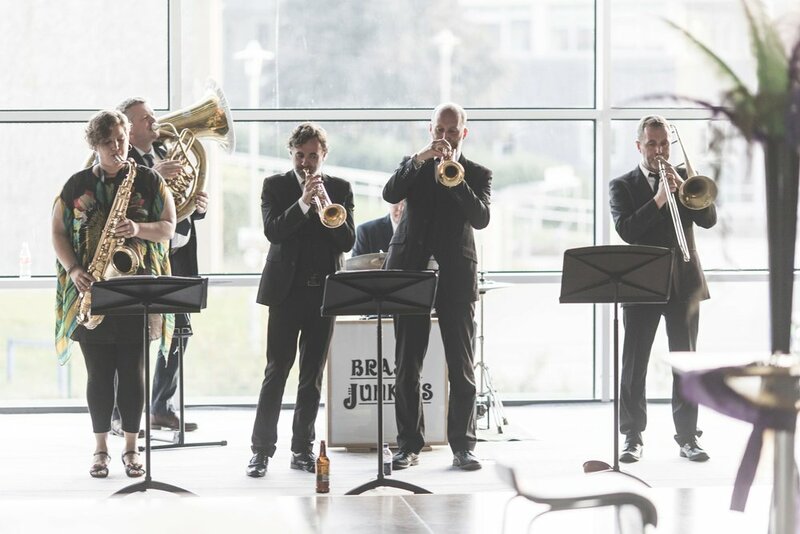 Brass Junkies played at our wedding and were more than we could have hoped for. Their music appealed to everyone and there was literally no room left on the dance floor! 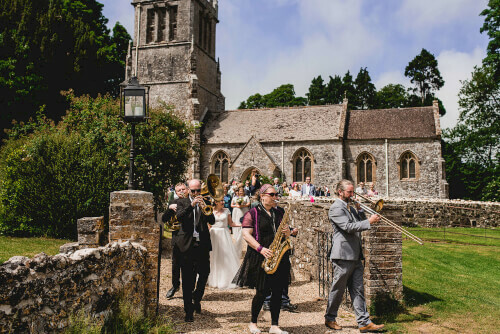 We really can’t thank them enough for their professionalism and their help, through the madness of organising a wedding I felt the band were the one thing I wasn’t worried about and I really appreciated it. 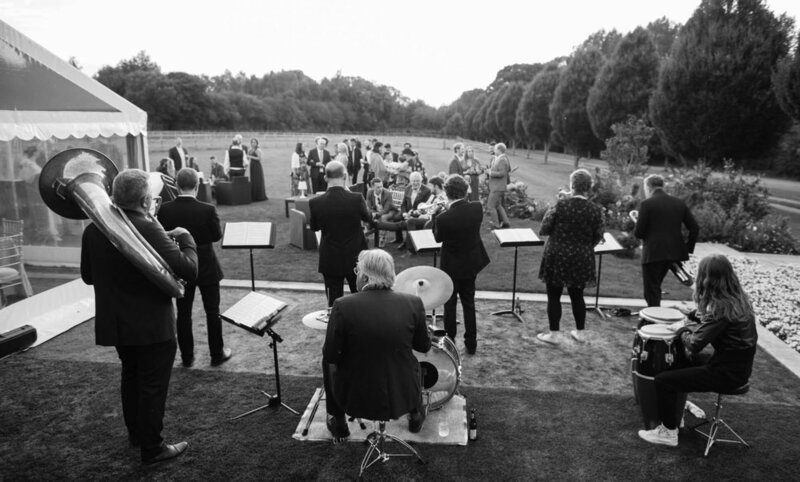 Music is such an important element of any event and Brass Junkies is well equipped to provide it. 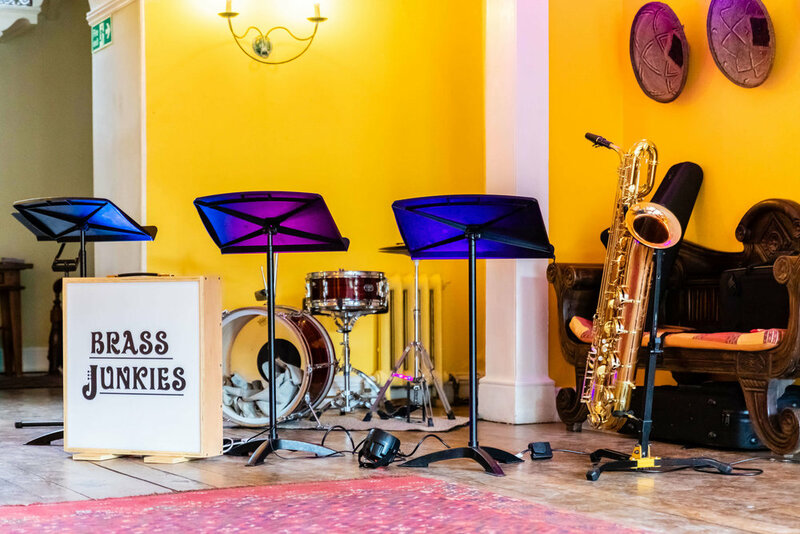 We have performed at a variety of Music Festivals including the Bristol Harbour Festival, Bristol International Jazz & Blues Festival and the family festival Starry Skies in Brecon, to name a few. Others include Food Festivals (EatDrinkBristolFashion) and Garden Festivals (Toby Bucklands Garden Fest) as well as Christmas Markets and Oktoberfest events. 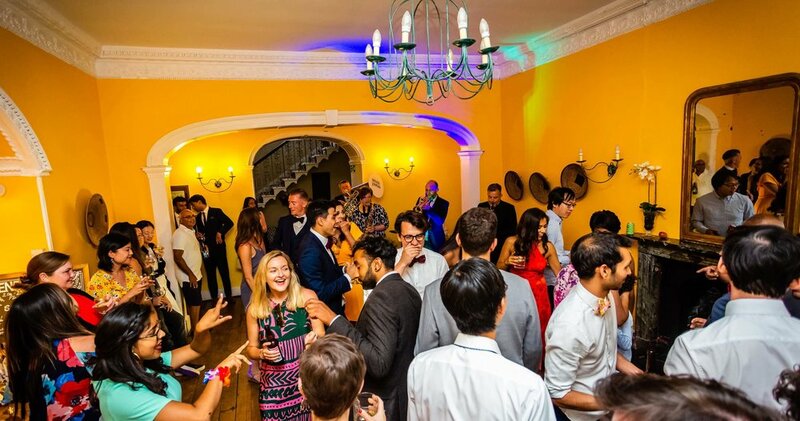 Also a long list of parties ranging from corporate celebrations to cocktail parties, house warming parties and birthday parties.